Thank you all for your nice comments about my Master Bedroom reveal yesterday. Christmas lights and wine barrels are not everyone's cup of tea so I do appreciate your sweet Sunny Notes. 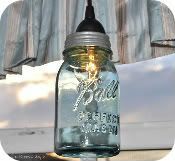 I am constantly changing my mind about how I want things to look in my home. I can't afford to by new furniture every time I do, so the next best thing to do is to paint. Paint can transform the look of any room or any piece. It is a good idea to label the drawers while you are taking them out to be painted that way you know where each one goes. Turns out that some dressers have drawers that are made to fit in the space. 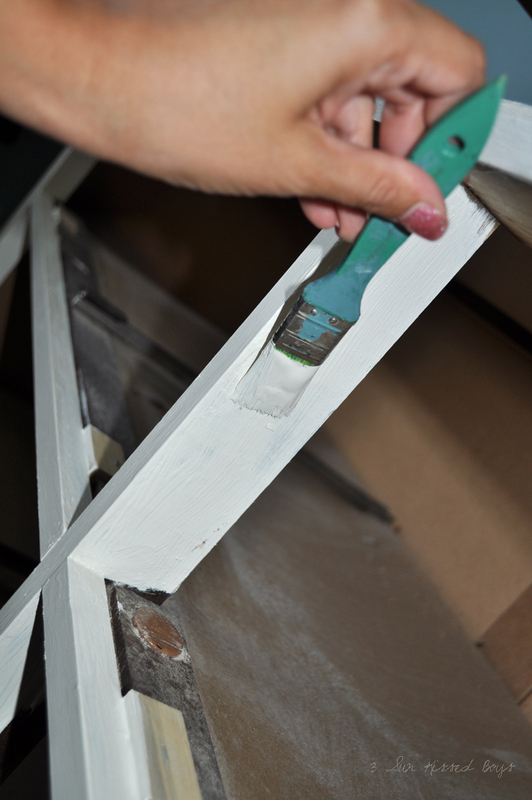 This is no big deal if you are just painting the dresser one color. If the drawer doesn't fit correctly, you can just take it out and try it in another slot. However, if you are doing a "puzzle piece decoupage", it will make a difference. 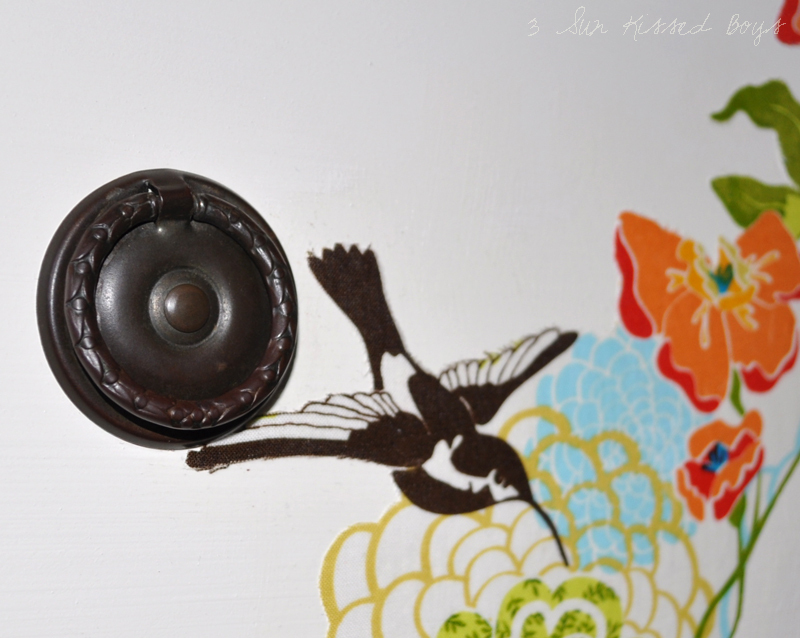 I used some of the same knobs just spray painted with RustOleum's oil rubbed bronze. 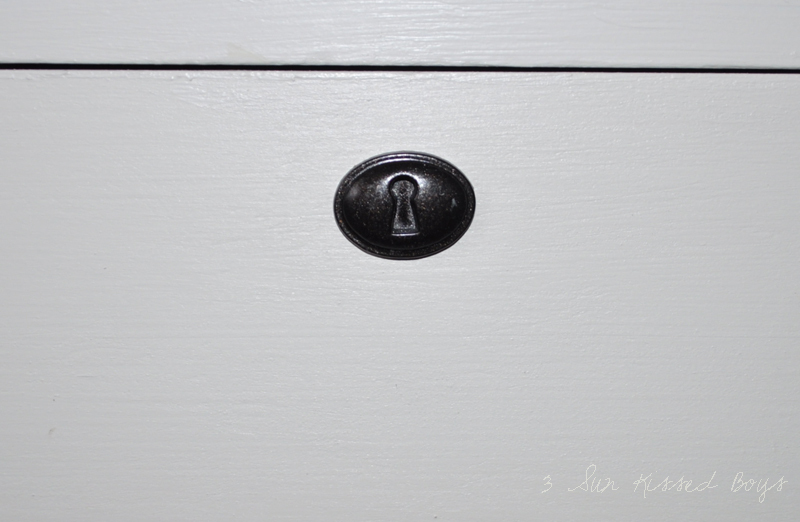 The knobs and faux key locks came from curbside dressers. 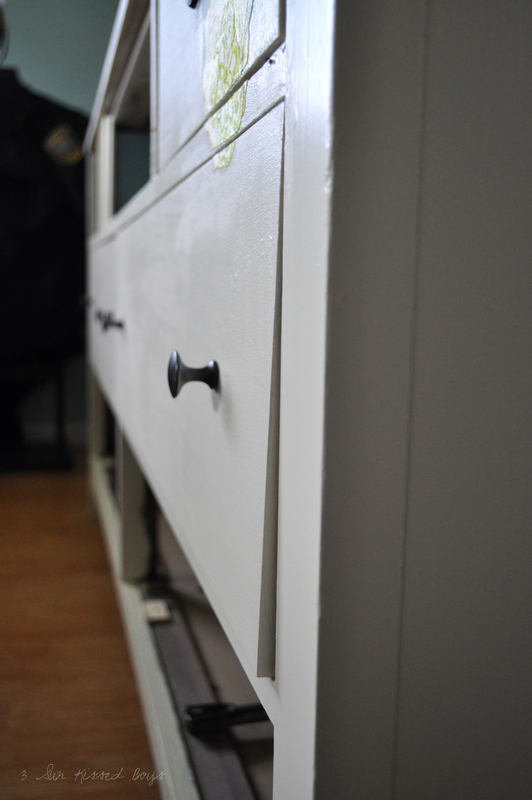 I couldn't use the dressers but I liked the knobs so I screwed them off and brought them home for future use. The future came calling for this dresser. 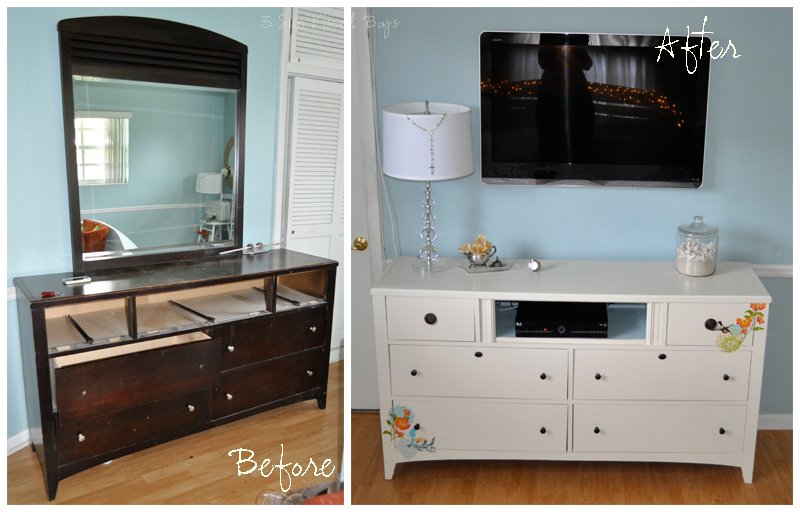 This dresser plays double duty as it's also an entertainment center. For the satellite box, I used the top drawer that came with the dresser. I hammered out the drawer front, painted the inside, and drilled holes to run the cords. 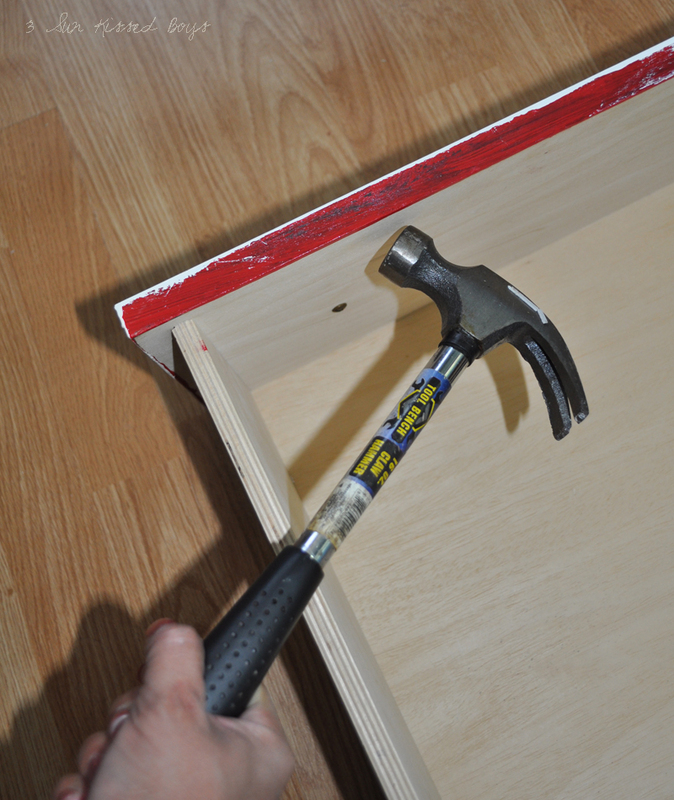 Tip #1: Drill holes before painting the drawer. 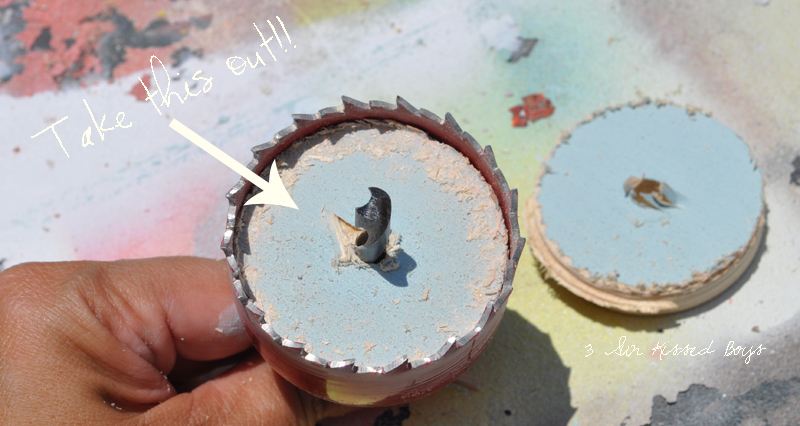 Tip #2: Start drilling from the front side(the side that people will see). See the hole on the left? It's chipped and unfinished. That's what happens when you start drilling from the back side. 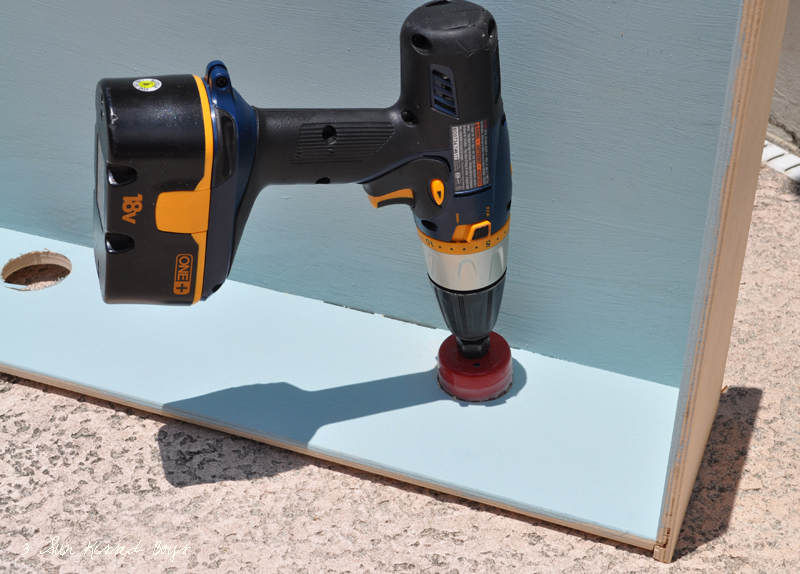 Tip #3: Your life will be a lot easier if you remember to take the previously drilled wood out before going on to drill a second hole. 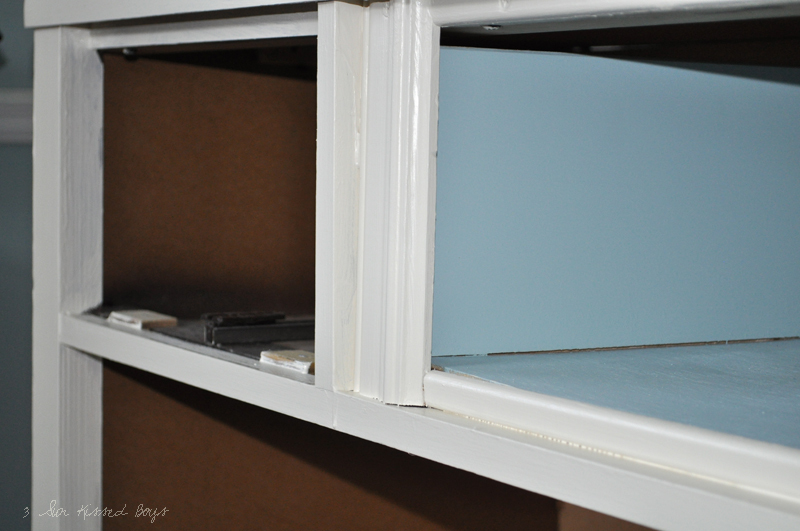 After I slid the drawer back in place, I covered the gaps with molding. Hammering the molding in should work. However, I am the worst hammerer. My nails always go in crooked or I hammer on the wood instead of the nail. So I ended up screwing the molding on. My point is, do what makes you curse less. I felt the dresser needed some umph, so I grabbed flowery fabric and cut it to shape. I placed the fabric where I wanted it to go and eyeballed where I wanted to cut to make it puzzle-like. 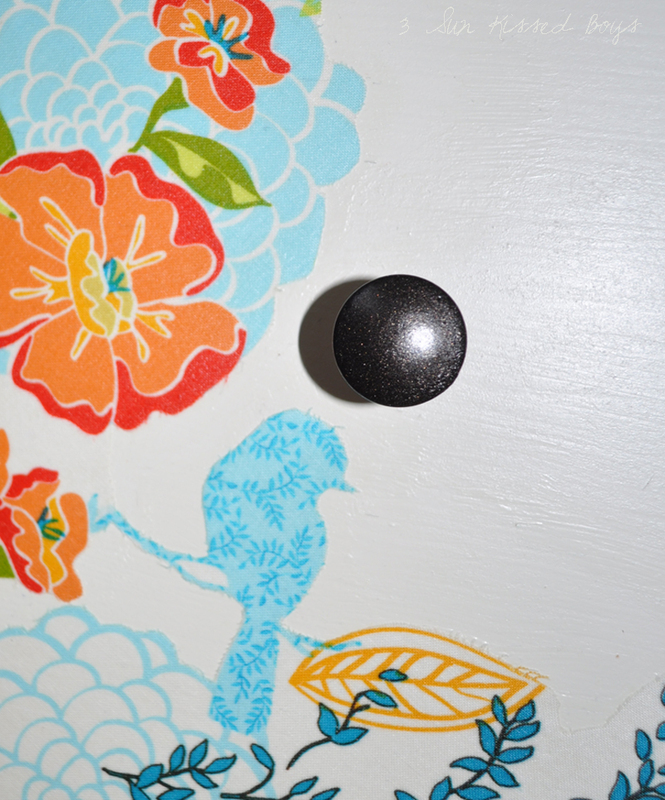 I applied a coat of Mod Podge on the dresser and placed my biggest piece down. I repeated this procedure on the connecting pieces. After it was all dried, I coated the fabric with Mod Podge. Once more, here's my pretty little redone dresser. Looks like a completely different piece, don't you think? Are you ready to customize YOUR dresser?! I know I don't do a good job of commenting on your blog but you are always doing the most incredible things. Let me know if you ever want to come over and play at someone else's house. You'd probably tell me, Ashley...you need to start by painting your walls! Oh my gosh Yanet this is GORGEOUS!!!! Girl you did a beautiful job on this and I adore the fabric!! And yes, perfect piece of advice, do what makes you curse less! I love it!! I am off to go see your room!!! 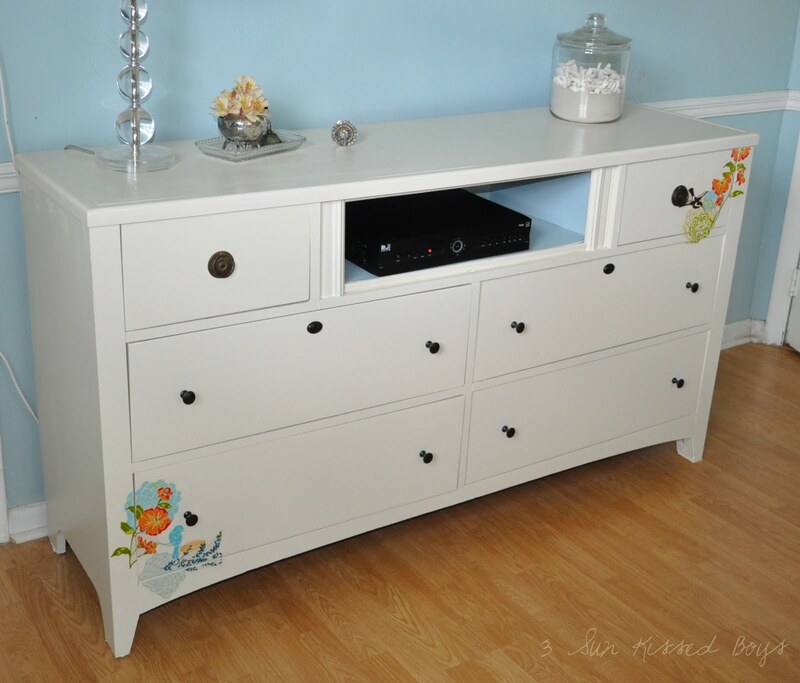 This is such a beautiful dresser-- love the idea of using the drawer to house your cable box! I love how this turned out! You did such a great job. Great pop of color with the fabric. I too am not good with the hammer. I probably would have just glued it on! I would love a flat screen for the bedroom. That is on the list! Did you run the cord in the wall? I love that you show all the screw ups! Gotta learn somehow! And i love the fabric! I have never thought of cutting out the pattern and gluing it to somehing like that! I must try it sometime! This is absolutely adorable. I was admiring the painting, thinking I can never paint like that, then read a bit further and realised it was decoupage. Genius! Long time lurker, first time poster but I couldn't resist - your dresser blew me away! Can't wait to find a piece of old furniture and customise it following your lead. You are a creative genius, Yanet! Just fabulous! Great tips too. 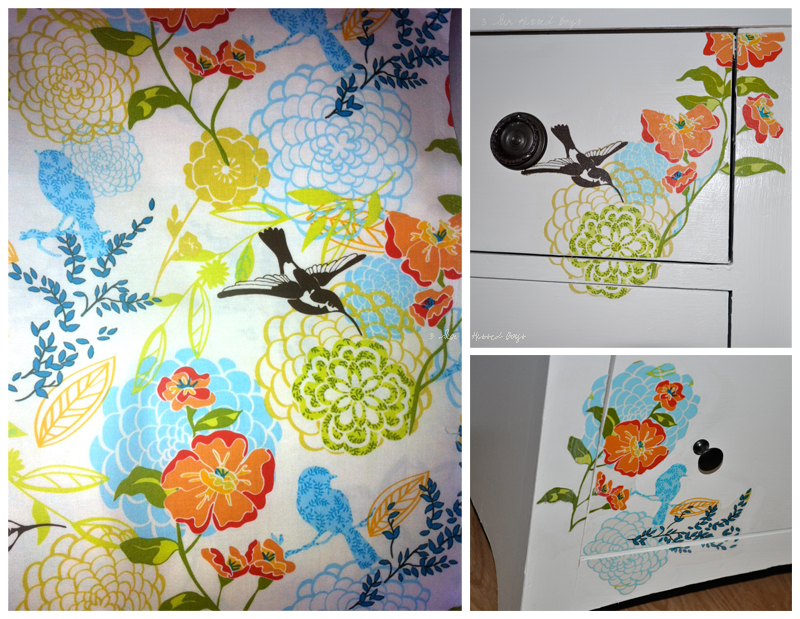 Love that you used fabric for decoupage. I forget about fabric, always going for paper. But the colors are delish! That is CUTE!!! I love that you only did two corners~it's just enough embellishment. CUTE,CUTE,CUTE Yanet! I love this dresser! Adding the beautifully bright colored fabric was the perfect touch! And thank you so much for taking the time to make it a tutorial! Beautiful. I love the decals. What a great transformation. 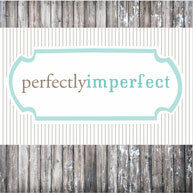 This post would be such a great addition to my blog party! 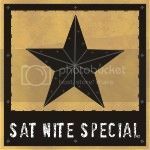 I hope you stop by and join in. Oh my gosh!!! That is beautiful! 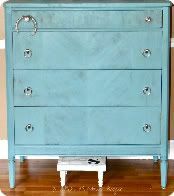 What an awesome idea to use fabric/mod podge on a dresser! So cute!! I love it! I like what you did with the shelf for the receiver. Would you mind mentioning a little more in depth what you did for the shelves. Very, very pretty! 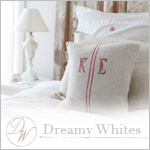 I keep looking for ways to customize furniture as well...hadn't thought of fabric yet! Great idea! You've got my wheels turning now! Love meeting fellow furniture makeover-aholics! 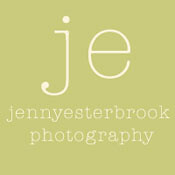 Lovely job! I like the fabric touches you added. SO fresh and beautiful!! Thanks so much for linking it up, Yanet!! This is beautiful Yanet!! I love that you converted the middle drawer! The fabric you chose is beautiful too! Great job!! This is gorgeous! I've been wanting to update my entertainment center for ages. You just may give me the motivation I need! I'm a new GFC follower, and I'm pinning this!